Post Production is an area which poses many challenges; software can inexplicably malfunction, cameramen can perform badly and that’s just the tip of the iceberg when it comes to potential problems. The best way to go into a post production project is to put yourself in the best possible position to succeed, and this means organising your files and folders. If file organisation is not approached in the correct way, it can have disastrous consequences further down the line. Before I get into my opinion of how a project should be organised, I’d like to point out that project organisation is very subjective. A system that works for one person may not be as effective with another. The trick is to find what works for you, and to ensure that it’s easy for a third party to interpret, if not embrace. With all the different components that go into a typical post production workflow, in order to work effectively you need to be able to navigate to one file out of potentially thousandsÃƒâ€š within seconds. Time spent hunting for files spread across multiple drives is time that could be better spent. Welcome back. You may have guessed already that this is a good example of how to not organise a project. This is a project folder where components have been dropped into the top level of the folder, meaning that there are all sorts of different files all in the same place. Imagine you are an editor who has just been given a project to edit, which was initially worked on by someone else — seeing this would definitely put a downer on your day. To top it all off, half of the media for that project is on a separate external hard drive — so once the two drives are separated, the project will have more media offline errors than you’ll know what to do with. Of course, this is not how we organise things here at Videvo…hmmm. 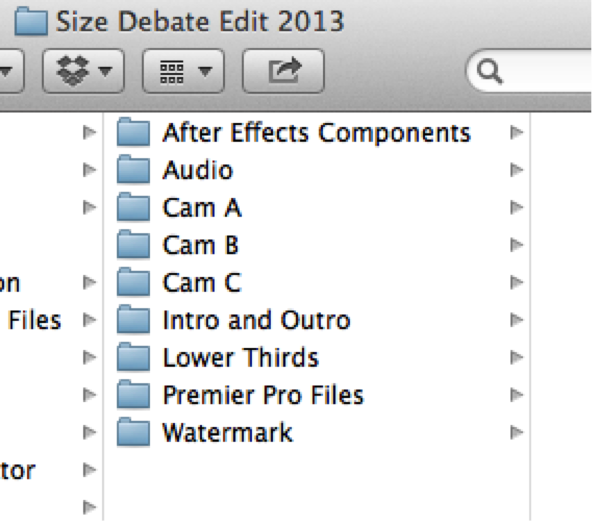 As you can see, the project is “Size Debate” and this folder is the top level folder, with a bunch of other folder. Folders everywhere! All the digital assets required for the project have been neatly organised, and After Effects and Premier files have been separated. This clean layout means that while navigating, you always know where you are, and you always know where to find things. I find it easiest to create folders for various elements of a production too, such as audio, stock media, lower thirds/titles etc, but how you do this is up to you. Every single component for this particular edit is within the main folder, and indexed so that anyone could pick up a hard drive with the project on it and begin editing.Ãƒâ€š This means that it’s impossible for a media not found error to crop up. 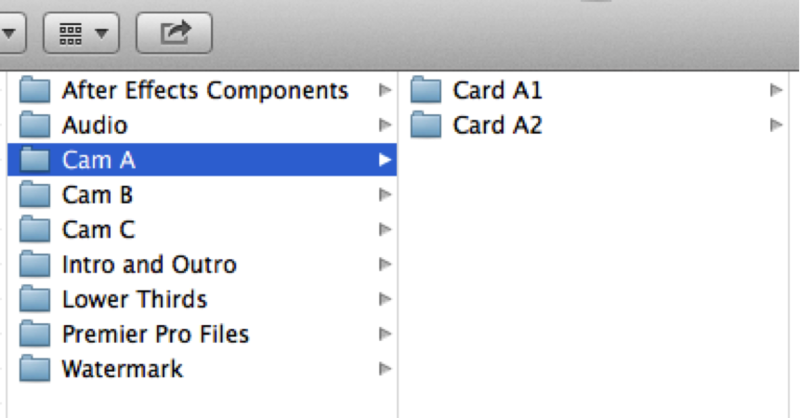 You should always create your edit folder file structure before you begin editing, and not during. Moving media about after you have begun editing means that you have to re-locate it within your editing software and can cause complications. Equally as important as structuring your edit folder, is structuring your bin folders so that it mirrors your project folders. If you have created your edit folder before you begin editing, you can import the exact same file structure into your editing software — which means that there is a uniform way of finding files in both the editing software and the hard drive, which helps avoid confusion. A common temptation among editors is to not bother with the preliminary file organisation and get right into the edit, the reason for doing this is usually to save time — but he logic behind such a decision is flawed, as we’ve demonstrated above. No matter how small a project may seem, it’s always best to think about the bigger picture. There are a number of occasions that may arise that suddenly complicate a project, more so than you may have predicted in the outset. For example if a client comes back and requests a reedit a year later (which happens more than you think it might), something that may have seemed like a simple project 12 months back is now a nightmare to deal with. Another thing to bear in mind is if there are multiple people working on the same project, it’s going to be much easier on everyone involved if things are kept organised. So remember, it pays to be organised – not only will it save you time in the long run, it could also save a big headache further down the line should you need to return to a project.